The year 2011 saw the beginning of China’s Strategic Emerging Industry (SEI) Program. As their current formulation, SEIs refer to the industries accompanying innovation in information, biotechnology, medical technology, new energy, environment, marine and space with strategic importance to China. The term “strategic emerging industries” was first mentioned in May 2009, when China’s Executive Vice-Premier Li Keqiang, who is expected to take over the premiership in March 2013, addressed a conference on financial support to new energy and energy-saving and environmental protection. 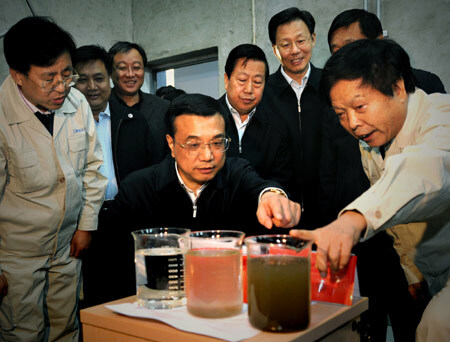 In his interview with Xinhua News Agency on 27th December, 2009, Premier Wen Jiabao indicated that China started research on nurturing new technological areas of economic growth, especially strategic emerging industries such as the Internet, green economy, low-carbon economy, environmental protection technology, biomedical technology and other important areas related to the environment and human life. On 18th October, 2010, the State Council issued a “Decision on the Acceleration of Nurturing and Developing Strategic Emerging Industries,” formally launching the SEI Program. The 12th Five-Year Plan for National Economy and Social Development (2011–2015), released in 2011, includes SEIs as one of its most important components. Of the seven SEIs that have been identified, four – energy-saving and environmental protection, new generation of IT, biotechnology, and high-end equipment manufacturing industries – will become the pillar industries with another three – new energy, new materials, and new energy automobile industries – being named leading industries, which will receive different levels of support. It is obvious that the initiation of the SEI Program is to transform China’s economic growth from dependency upon external demands to seeking internal demands. With the world financial and economic crisis, China’s exports have slowed down, putting pressure on its export-oriented economic growth model. Meanwhile, China’s urbanization and the development of its tertiary industry have increasingly enlarged its domestic market so as to provide support to the SEIs. Moreover, Chinais keen to decrease foreign technology dependency and boost indigenous innovation capability. This is why the underlying components of the selected SEIs are technologies, traced back to the National High-Tech Research and Development Program, known as the 863 Program, administered by Ministry of Science and Technology (MOST). Nevertheless, it is the National Development and Reform Commission (NDRC) and the Ministry of Industry and Information Technology, two super-ministries with strong economic missions within China’s bureaucracy that have led the SEIs. In particular, NDRC is in charge of three – energy-saving environmental protection, new materials, and biomedical industries while MIIT takes the lead on another three – new energy, new energy automobile, and high-end equipment manufacturing with new generation of IT being a joint effort between MIIT and NDRC. It is also expected that these two government agencies will involve more enterprises rather than merely scientists from universities and research institutes, as programs run by MOST usually done. That is, while closely related to science and technology, the SEI Program is not an S&T led program or at least is not a purely S&T program; it has strong economic components and targets. The fact that economic instead of science agencies are deeply involved in the SEIs reveals a long-standing issue – the separation between research and the economy – that China has tried to solve when it started to reform its S&T management system in the mid-1980s. Indeed, the government may not have beensatisfied with the outcomes commensurate with the enormous investment into science and technology. Or it may have finally realized that innovation needs the economic actors, rather than the technical community, take the lead. As there are other national S&T programs, therefore, the success of the transformation of the Chinese economy will to a large extent depend upon the success in the coordination of efforts at different government ministries, which has been proven difficult. I always believe that the Central Government may have big, grand plans or programs to improve or enhance environment but these are all solution led and it has not been able to solve the problem from ‘top down’. That means how far can it go with the execution of all these plans if people down below or ministries are not prepare to cooperate. Will corruption & ‘guanshi’ hamper this bill being implemented? A good environment has to begin with the education of the people in caring for it’s environment and it’s neighbour. Thanks for the comments. Totally agree with you that the top-down model can only go so far and the establishment of an environment conducive to innovative work is the most important.